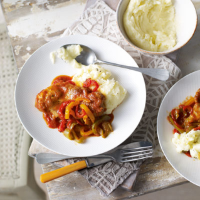 Just five ingredients to create a tasty midweek dinner. The onion chutney adds depths of flavour and also saves time. 1. Heat the oil in a large frying pan and fry the pork steaks for 5 minutes on each side. Add the peppers and fry for 2 minutes. 2. Stir in the chutney and then pour in the tomato and basil sauce, simmer gently, covered for 10 minutes until the pork is cooked throughout. 3. Serve with creamy mashed potatoes and home-made onion marmalade. For the remaining caramelised red onion chutney: spread over puff pastry and dot with goat’s cheese pieces, then bake. Make sticky sausages by adding spoonfuls of the chutney and stirring into a pan of hot, cooked sausages just before serving.